Amor de Fio's handcrafted stitch markers add an exquisite tinkle to any project. Made of sterling silver, precious stones, and handcrafted glass, in two sizes, these markers are just divine. Our gift set features 2 sets in any combination of styles (1 small, 1 large) to make sure they can add some sparkle to any size project. Yummy ivory and browns with a turquoise glass accent... like a latté in a beautiful cup. 4 stitch markers on a sterling holding ring. 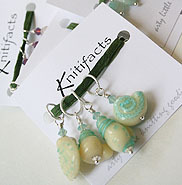 Please also see our KNITIFACTs line of stitchmarkers, ringers and bumpers - great additions to any toolkit! Makes a FANTASTIC KNITTING GIFT!